Potpourri is a mix of aromatic dried flower petals, leaves, herbs and spices, together with essential oils and base materials that help retain the desired scent. The Cornell University Cooperative Extension of Schenectady County suggests adding rose geranium oil to a rose-petal potpourri. Rose geranium essential oil smells like rose oil, but is significantly less expensive. The Ananda Apothecary, purveyors of essential oils for aromatherapy, notes that there are two species of rose geranium used for essential oil distillation—Pelargonium odorantissium, with a strong rose-like scent, and Pelargonium graveolens, whose more citrus-like aroma is used in insect repellents. 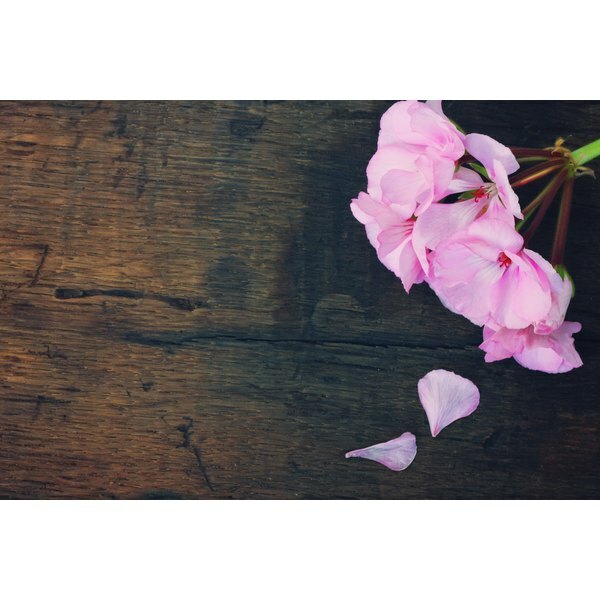 Used in aromatherapy uses, Ananda Apothecary suggests that rose geranium's uplifting scent helps calm fears and uplift energy, inspiring creativity. Rose geranium essential oil can be placed in bowls around the home, or used in sachets to infuse its rose scent on clothing and bed linens. Rose geranium essential oil, blended with lavender oil in an almond and Vitamin E oil base, creates a wonderful massage oil for relieving tension. The combination of lavender and rose geranium is one of the most popular in massage oils for its relaxing effect. The Ananada Apothecary advises that rose geranium oil is versatile, with its scent being perceived differently by different people; it is also warming to the touch, making it an excellent ingredient for massage oils and lotions. Rubbing a lavender and rose geranium massage oil into sunburned skin to diminish the sting and reduce the dry, itching peeling which can occur due to sunburn damage. According to Ananda Apothecary, rose geranium essential oil is one of the best oils for a wide range of skin ailments and conditions, including eczema, varicose veins and dermatitis. A few drops of rose geranium essential oil can be added to dry skin lotions or creams, or a simple base of almond oil or a healing salve such as comfrey, and gently massaged into the afflicted area several times a day.